We are based in Caldbeck, on the village green in the Joiner’s Hut. 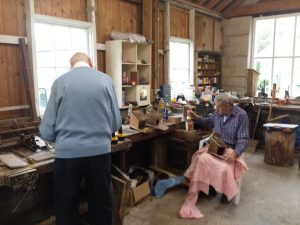 Open Tuesdays and Thursdays, 10.00-2.00 p.m.
At our fully stocked workshop you are assured of a welcome, a cuppa and some male company. We have a wide choice of hand tools and woodworking machinery. You are free to use equipment independently but support and instruction is always available from Ken the Shedmaster. People are free to bring their individual projects or items needing repair e.g. chair legs.